Tiggy on Speed or Sponsored Tiggy is the literal English translation (not really). shorter than what I have been writing, as it has been taking ages to post. 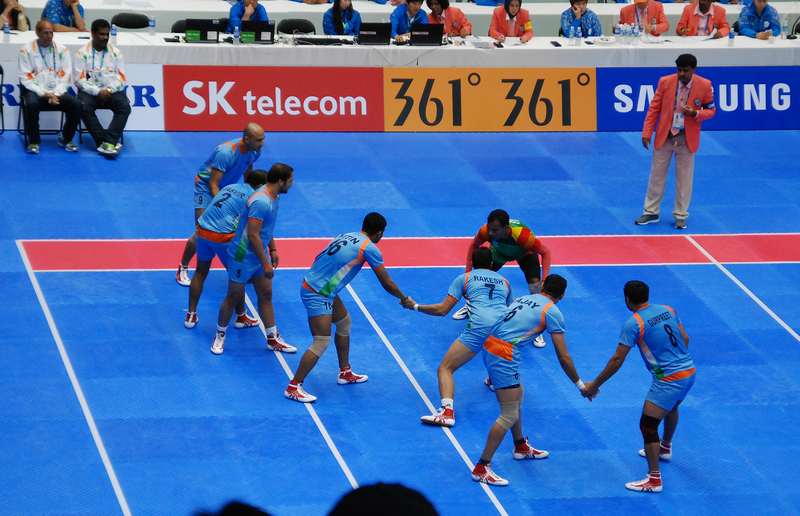 ‘In the international team version of Kabaddi, two teams of seven members each occupy opposite halves of a field of 10 by 13 metres (33 ft × 43 ft) in case of men and 8 by 12 metres (26 ft × 39 ft) in case of women. The game is played with 20-minute halves. The teams take turns sending a “raider” into the other half. To win a point, the raider must take a breath, run into the opposing half, tag one or more members of the opposite team, then return to their home half before inhaling again. The raider will chant “kabaddi, kabaddi” with their exhaling breath to show the referee they have not inhaled. The raider will be declared “out” and will not gain the point if they inhale before returning to their side, or returns without touching an opponent. The tagged defender(s) will be “out” if they do not succeed in catching the raider who tagged them. Wrestling the raider to the ground can prevent them escaping before they need to inhale. It is like a mass game of Tiggy with the odd pile on and the added wrinkle of having to hold your breath (not immediately apparent to the viewer BTW). What struck me though was that there was an Australian team in the Kabaddi World Cup and I had no idea that Kabaddi even existed. Unfortunately, they were being annihilated 1,000,000 to nil by Bangladesh. Why it primarily surprised me was that I spent the best part of my childhood watching Wide World of Sports all Saturday afternoon most weeks and chanced upon what I thought was every obscure sport known to man. Strongest man in the World competitions. Gaelic Football. All staples of WWOS. No sport was too obscure for WWOS. What was even more memorable was the empty promises of the WWOS team that Boxing was coming up next. My Father and I would longingly wait for Boxing all afternoon. 242 ad breaks later there would be a one minute snippet of Boxing. Let’s just say that state of affairs did not please my Father or myself. Happy days. The College Basketball season. Go Indiana! Next exciting episode will be on Thursday, 17 November 2016 titled ‘Why Western Michigan should play in the College Football Playoff’. This entry was tagged Australia, Kabaddi. Bookmark the permalink.